Hassle-free way to track leave balances. WeWorked does all the calculations for leave accruals and time off. 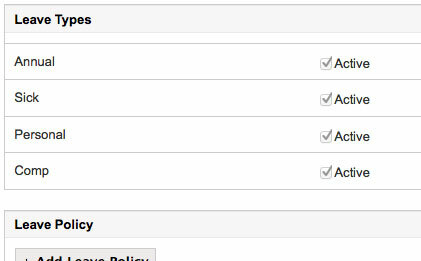 Just setup a leave policy, and WeWorked will handle the rest. Your business may not offer all the default leave types in WeWorked. Perhaps you just give people "Paid Time Off". Whatever the case, WeWorked can accommodate. Rename, activate, and disable leave types to your liking. Leave policies that match your business. You decide if, when, and how much leave people receive. Setup an unlimited number of leave policies. You even get to determine when the leave rules go into effect. For example, people may accrue a greater number of hours after a year on the job. People can view their leave balances. Tired of people asking how much leave they have? WeWorked eliminates the pain. People can view their leave balances from their profile. They no longer need to contact HR or ask you.